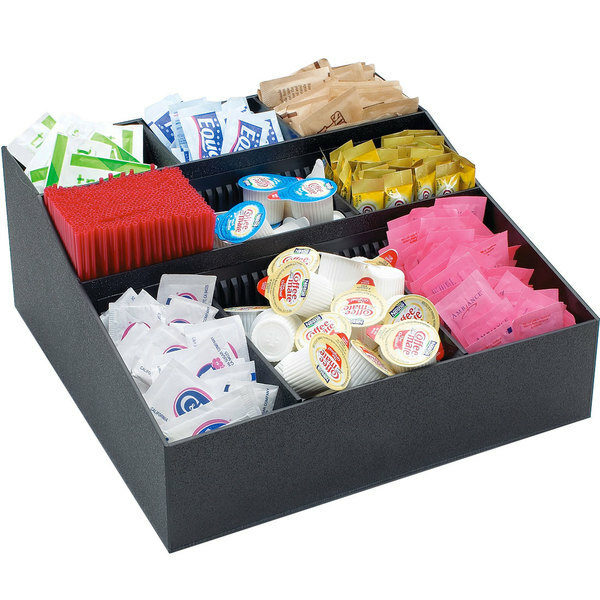 For maximum organization of necessary condiments and the most customizable options, use this black Cal-Mil 1260 9-compartment adjustable coffee condiment organizer. Dividers separate this piece into 9 individual compartments, ideal for displaying sugar, artificial sweeteners, and non-dairy creamers. It's perfect for coffee stations, cafes, buffets, and more. Best of all, the section dividers are adjustable, so you can create the display that best suits your needs. A classic black finish and durable ABS body round out the attractive features of this organizer that's sure to serve your establishment's needs perfectly. Overall User Rating: Cal-Mil 1260 Adjustable Black Coffee Condiment Organizer - 12" x 12" x 5"
This is exactly what we needed for our coffee station. This is a nice size, and compared to other organizers, this was the best price. Very happy! This item is very nice, but the design makes it hard to keep clean. The sections are very small, and need to be tended often in a high volume environment. Great for light duty, tough for a busy coffee counter. The adjustable feature is great. I only use this for coffee creamers, sugars, and stir sticks so I can get a lot in the organizer at one time. space saving too. We have had this caddy for years and it still looks like new and has no cracks even with being used by the general public for all this time. The extra compartments are great! I use these daily. I like the size and the fact that they it is problem free. The many adjustable compartments are perfect for my coffee station. We got this item cracked. Called customer service, told us to call the manufacturer who shipped it out. Nothing. Pretty upsetting considering what we paid for the item plus shipping. Thanks for the review! We're sorry this item was damaged. A Customer Solutions Representative will remain in contact with you until the issue is resolved. Holds a decent amount of various things like stirrers and sugar and it's also a great price. It doesn't take up too much room. Good buy. Fits all my coffee condiments very nicely and looks great. It has adjustable insert also. I would definitely recommend this to anyone that needs it. Very good coffee organizer. Excellent for several condiments and varieties of coffee and tea. Holds a good quantity of stirs, napkins, and creamers also. Adjustable inserts for compartments are a bonus. This is a fantastic organizer! Being an organized person myself, this makes it easy to keep our stand organized and easy to use for any of our guests. This keeps all of my coffee condiments well organized and proffesional. This is my buisness and I need to make an impression. This product helps me do just that! it's well designed and just right for organizing our condiment. I couldn't find cheaper price for the same quality products. I would Highly recommend it. This item has been put in all 7 concession stands. It's perfect! Love the fact I can change the compartments as needed. Our condiments vary from show to show and this adds the capability to make small changes easy!